Nearly every night as soon as I log out of work I throw on my pack and head out the door. It is so commonplace now that when I move my pack, the dog jumps up and heads for the door – even when I’m moving it onto the bed to play rearrange the contents 🙂 Tonight was a night I could have just kept walking until I got where I didn’t know I was going. I had a week’s food on my back, clothes, water, shelter. The night wind was brisk and stinging, taking your breath away to another place when it hit you full on frontally. The smell of frying rice, Thai chiles, garlic and meaty things bowled me over as I passed behind a little Thai restaurant in the alley and made me remember fair food on crisp February winds from days long gone by. The wind scuttled the clouds to and fro over the brilliant sliver of the moon in a blustery game of hide and seek. Sometimes people give you the smallest little gift and makes your heart sing and a smile bust out every time you use it. Can’t beat useful things that make you smile. 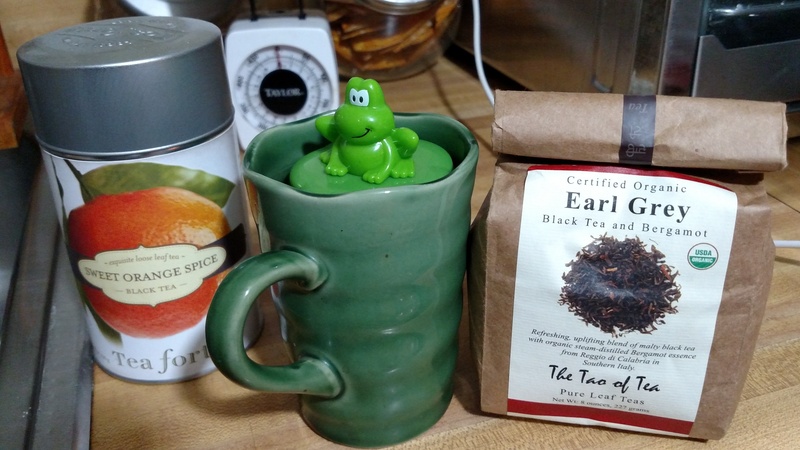 It’s a gift from my Mom, surrounded by my teas of choice this week. Yuummmmmm, hot tea and brisk nights. Gear testing faux pas was followed quickly by beauty and joy this week. During an anticipated storm I pitched my new tent (pitch being relative, I have no yard, just a concrete patio) to test it for waterproof capabilities. It helps greatly when testing that to set said tent up correctly. Did I do that? Nope. While I had set the tent up once before, that was on a nice sunny day with no wind. This time I tried to repeat normative expected conditions on the trail – after dark, whipping winds, impending rain. I did not close the top vents, and when this discovery resulted in rain in the tent, I then closed them…also incorrectly (but on time delay setting). After a microburst tossed the 100 or so lb deck umbrella and stand around and crashed it into my apartment awning, I was wide awake and shaking. Regrouped in the apartment and headed back out to tough it out. The lightning wasn’t nearly as frightful as the wind. But the rain dropped to a gentle patter and I finally fell asleep about 3 a.m. That was followed by a drippy alarm clock of rain on my face at 5:30 a.m. (time delay, remember?) Although I had closed the ridge vents, I did not do it right and while I snoozed the rain oozed. I woke up in a big sponge (also known in some quarters as a sleeping bag). I was dry and warm inside, but the outside was a puddle-sucker. Frustrated, I went inside and crawled into my windless, dry bed. In the daylight I discovered my erroneous ways, fixed the tent, and hung everything up to dry. The following night was pure bliss: no rain, cold temps and crystal clear skies. I fell asleep staring at the stars and listening to Ray Lamontagne’s “Winter Birds” and slept like a warm swaddled baby. 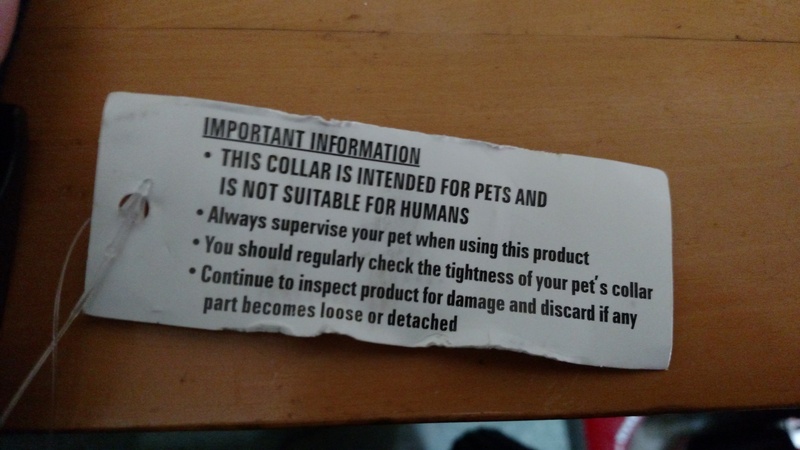 It has been a long time since I bought a collar for my dog. I don’t recall ever reading this in my past purchases. My most recent acquisition came with the following warning. I think I might need brain bleach after mentally envisioning Bubba or Missy on all fours acting out some Realtree fantasy as a result. The horror. “Lil bit, think about every Monday since you were born, getting up and going to do something someone else wants you to do, and then add 15 years to that number. Think about all of the weeks that you give, and you get two days a week and two weeks a year to call your own. It makes you tired, all of that doing for someone else – and for what? A bigger television, a newer car, larger house, all of which insure you will continue that grind because now you have more bills to pay. Then fast forward to now; you’ve moved up on the ladder an now you give your days AND your nights, plus, sometimes when you are out on a weekend trying to capture some happiness, your job also calls you when you are in the middle of the woods trying to unwind and let go. I am to the place that I would rather live small and, in your mind, hard, in exchange for more time to do things that bring me pleasure, making memories instead of money.” I then asked her if she could remember any gift I had given her very clearly over the years. Then I asked her if she remembered the hours we’d walked on the beach at night with a flashlight and talked, digging up funky or pretty stuff at the surfline. If she remembered the hikes up Amicolola Falls, or the walks along the Toccoa River in winter breaking ice and boulder jumping. If she remembered the summer at the beach house and me taking her sisters pier fishing. She could not remember any gift, but those things, she did remember. Maybe, just maybe, I got a fraction of my feelings across to her at a time when she and her partner are trying to climb the ladder of ‘more’. Why would I choose to live primitively on purpose? So I can get back to the lifestyle I enjoy faster – save money, garden again, work the kinks out of the life I envision. Plus, it’s good practice, because if I can live like that in the heat and humidity here, anywhere else will be a cakewalk. Besides, what good is life if is isn’t challenging you, stretching you, finding out what lies underneath? ~SE Dreamin’ and wanderin’….what are YOU doing with this one fine life you have? I loved this and shared it! What a great way to explain parental ‘weirdness’ to your children. I may steal it. :) I listened to each accompanying song. You started my day out with a beautiful reflective peace. Thank you!! So glad you enjoyed the music Bren – great musicians both, and thoughtful lyricists. I often struggle to articulate things that mean a lot to me, on the fly verbally, except with one or two long-time friends with whom there are no preambles required 🙂 Spread the idea, maybe it will take some of the pressure off of families and give them more time together so that the bonds are stronger! Thank you for sharing my words! I heard you all the way down here 🙂 Keep warm up there, and thanks for always listening to me yak away without preambles, lol!